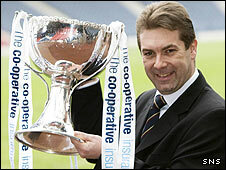 Co-operative Insurance are extending their sponsorship of the Scottish League Cup by two years until 2011. The firm has backed the competition since 1999, though it was known until this season as the CIS Insurance Cup. David Longmuir, chief executive of the Scottish Football League, said: "We are delighted to be announcing this contract renewal. "It is great news for Scottish football in general and The Scottish Football League in particular." Rangers won the tournament last season, following a penalty shoot-out success against Dundee United at Hampden. United will meet Celtic in this term's semi-finals later this month, while Rangers take on Falkirk. "The Co-operative Insurance's dedication and commitment to the League Cup reflects the importance of football in Scotland's culture, its importance to the current and emerging generations, and its role at the heart of communities, towns and cities throughout Scotland," added Longmuir. First Minister Alex Salmond attended the sponsorship announcement at Hampden and he believes football can battle through economic recession. "I think there is pressure on individual clubs and has been for some years, and therefore nobody can be complacent," the Scottish National Party leader said. "Every business in the country is finding things tough and football clubs are no exception. "Therefore, everyone has to try that bit harder and the example of this renewed sponsorship is an example of the Scottish Football League trying that bit harder."